We offer Sai Bo, Yoga, Shiatsu, Holistic Health Therapy, Aroma Therapy, Stress Relief, Private Tuition, Beauty clinic, Brat pack. Exercise is good for the mind, not just the body. Exercise can help with stress relief because it provides a way for the body to release tension and pent-up frustration. How does massage therapy ease stress? A professional massage can provide soothing, deep relaxation and can improve physiological processes such as circulation. As the tense muscles relax, so does your entire body, as well as your overstressed mind. The most common type of massage is Swedish massage, which is specifically meant to relax and energise you through stroking and kneading the muscles. 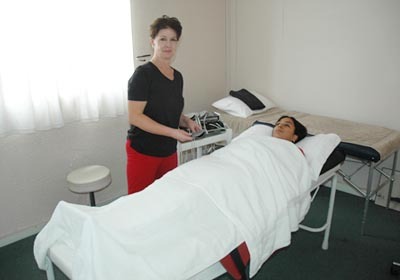 Another common type of massage is Shiatsu, also known as acupressure. Therapists use their fingers to manipulate the body’s pressure points to open channels that can release fresh energy and carry away spent energy and toxins.